Immunoprecipitation and immunoblotting of wild-type cells treated as indicated (n = 3 experiments). i=TGFβR inhibitor:SB525334. Nature, 2017, 551(7678):105-109. SB525334 purchased from Selleck. Increased dietary salt intake activates the Smad2 signaling pathway to promote a decrease in endothelial PTEN levels, phosphorylation of Akt at S473, and phosphorylation of NOS3 at S1177. 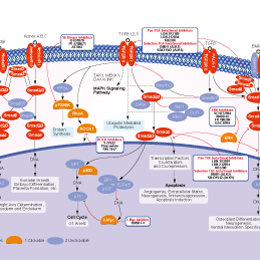 The TβRI/ALK5 kinase inhibitor, SB525334, prevented the salt-induced increases in Smad2 phosphorylation and the downstream signaling events that included the reduction in PTEN levels and increases in phosphorylated Akt(S473) and phosphorylated NOS3(S1177). The graphs on the right represented the pertinent relative protein levels of all the animals in the study (n = 6 rats in each group). *P < 0.05 compared to the other 3 groups. Hypertension 2013 62(5), 951-6. SB525334 purchased from Selleck. LS 174T and SW480 cells were treated with SB525334 (1 umol/L) for 12 hours. HMGA2 expression was assessed by immunoblotting. Each experiment was repeated 3 times. Bars, SD; *, P < 0.05; **, P < 0.01. Cancer Lett 2014 355(1), 130-40. SB525334 purchased from Selleck. (A) The cellular appearances of EMT were observed in Bel7402-siAZGP1 and controls pretreated with SB525334 (inhibitor of TGF-β1/ALK5), LY364947 (inhibitor of TGF-β1/2), PD98059 (inhibitor of ERK) and DMSO. (B, C) CDH1 (E-cadherin) and Vim (Vimentin) mRNA were detected in 8 groups (**compared with controls pretreated with DMSO, p < 0.001; ##compared with controls pretreated with LY364947, p < 0.001). Cancer Lett, 2016, 374(2):241-9. SB525334 purchased from Selleck. J Cell Physiol, 2018, 233(8):5780-5791. SB525334 purchased from Selleck. Ang-(1-7) appears to inhibit MGA-induced fluorescent staining for de novo expression of α-SMA in NRK 52-E cells. Cells were incubated with serum free media (A and C) or MGA (100 uM, B, D-I) or TGF-β (5 ng, J) for 72 h. MGA-treated cells were treated with either Ang-(1-7) (100 nM, E), Ang-(1-7) and DAL (10 uM, F), ERK1/2 inhibitor PD98059 (1 uM, G), TGF-β receptor kinase inhibitor SB525334 (1 uM, H) or AT1 receptor antagonist losartan (1 uM, I). The immunofluorescent images are representative of 3 different cell passages. Cell Signal 2014 10.1016/j.cellsig.2014.09.010. SB525334 purchased from Selleck. The effect of ERK1/2 and Smad2/3 signaling pathway inhibition by SB525334 on the TGF-β1-stimulated expression of TIMP-3. Chondrocytes were pretreated with the TGF-β1 receptor I (ALK5) kinase inhibitor SB525334 (1 uM) for 60 min followed by stimulation with or without TGF-β1 (10 ng/ml) for 48 h. TIMP-3 protein levels, as evaluated by Western blotting. (C) C3H10T1/2 cells transfected with pEF-BOS or pEF-Flag-TAZ were cultured for 8 days in osteogenic medium (OM) including ascorbic acid and β-glycerophosphate in the absence or presence of TGF-β inhibitors (SB-431542 or SB-525334). ALP activity was measured in the cell layer and normalized to cellular protein content. Data are expressed as means 6 ± SD ( *p < 0.05 vs. pEF-BOS, # p < 0.01 vs. vehicle) (D) Quantitative RT-PCR analysis of Col 1 and ALP in C3H10T1/2 cells. In order to determine the potency of SB 525334, purified GST-tagged kinase domain of ALK5 is incubated with purified GST-tagged full-length Smad3 in the presence of 33P-γATP and different concentrations of SB 525334. The readout is radioactively labeled Smad3. To determine the selectivity of SB 525334, purified GST-tagged kinase domain of ALK2 and ALK4 are incubated with GST-tagged full-length Smad1 and Smad3, respectively, in the presence of different concentrations of SB 525334. IC50 values are calculated. Method: RPTE cells are seeded on microscope slides. The following day, the cells are starved for 24 hours to dosing by removal of the serum and epidermal growth factor. Cells are treated with either 10 ng/mL TGF-β1, 1 μM SB 525334, or a combination of both. Slides are pretreated with SB 525334 or starve media for 3 hours prior to a 1-hour incubation at 37 °C with TGF-β1 or starve media. The cells are then fixed and permeabilized. The slides are blocked with BSA, incubated with a mouse anti-Smad2/3 primary antibody followed by an anti-mouse IgG fluorescein secondary antibody. The slides are then viewed in a confocal microscope and nuclear signal intensity is analyzed. Grygielko ET, et al. J Pharmacol Exp Ther, 2005, 313(3), 943-951. Thomas M, et al. Am J Pathol, 2009, 174(2), 380-389. Laping NJ, et al. Clin Cancer Res, 2007, 13(10), 3087-3899. Higashiyama H, et al. Exp Mol Pathol, 2007, 83(1), 39-46. I want to know the feasibility of using the compound via oral gavage in rodents (dosing, frequency, formulation…)? 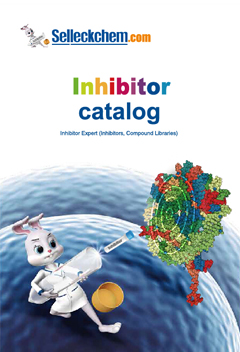 LY2109761 : TGF-β receptor type I/II dual inhibitor, Ki=38 nM/300 nM. SB431542 : Potent and selective inhibitor of ALK5 with IC50 of 94 nM, 100-fold more selective than p38 MAPK and other kinases.